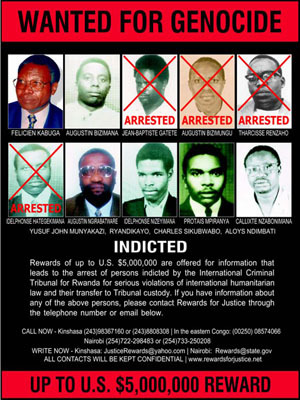 and the Beginning of the "Apocalypse"
The documents obtained under the Freedom of Information Act by Archive consulting fellow William Ferroggiaro identify the elite Presidential Guard as perpetrators both of the shoot-down of the Rwandan president's plane and the targeted killings that laid the basis for the ensuing slaughter of an estimated 800,000 Rwandans from April through July 1994. The U.S. defense attaché in Rwanda, who reported to State Department, defense intelligence and U.S. European Command officials, on the second day forwarded "reports that the Presidential Guard is "out of control" on the streets of Kigali while all other military units remain in their barracks". Around 8 PM local time on the evening of April 6th, 1994 the plane carrying President Juvenal Habyarimana of Rwanda and Cyprien Ntaryamira of Burundi was shot down over Kigali, Rwanda as the presidents returned from a summit of regional leaders in Tanzania. Both men died, as did their senior aides and the French aircrew. Within hours, the Presidential Guard was out on the streets setting up roadblocks in Kigali and going house-to-house to find and attack prominent Rwandan opposition leaders and Tutsi civilians. The genocide in Rwanda had begun. With reports of the deaths of the presidents, Washington--and the world--reacted. The U.S. government responded with statements offering condolences and condemning the violence; established inter-agency committees and intra-agency task forces to monitor the situation and coordinate policy; contacted Belgian and French officials to coordinate a response; and ordered the evacuation of American citizens from Rwanda. These documents highlight what the U.S. knew and how it responded in the first three days of the crisis. The Secretary's Morning Summary is just that--a summary report of important intelligence items produced for morning delivery to the Secretary of State, which is also distributed to senior officials of the State Department and other departments and agencies. This Summary item reports the shoot-down of the plane, offering as potential culprits "hard-line Hutu soldiers, the former rebels of the Tutsi Rwandan Patriotic Front (RPF), or someone else seeking to fan Hutu-Tutsi tensions." Noting the political and historical connections between Rwanda and Burundi, State analysts indicate "The incident may also spark an upsurge in violence in Burundi." CIA produced the highly-sensitive National Intelligence Daily six days of the week for top policymakers at the White House, State and Defense departments and other agencies. (Note 3) On April 7th, CIA analysts predicted the shoot-down of the plane would cause "Hutus in Rwanda" to "seek revenge on Tutsis" and predicted that "the civil war may resume and could spill over to Burundi". The State Department's intelligence arm, the Bureau of Intelligence and Research, produced intelligence appraisals beginning shortly after reports of the shoot-down of the plane in Rwanda. SPOT reports are intelligence reports written 'on-the-spot' intended to 'flag' severe problems for senior Department of State officials. This report from the morning after the shoot-down relays information provided by U.S. Ambassador David Rawson in Rwanda. Rawson-who had already met with Col. Theoneste Bagosora, the genocide's mastermind, Gen. Augustin Ndindiliyimana, the head of the National Police, and Ephrem Rwabalinda, the army's liaison to UNAMIR that morning-reports that "rogue Hutu elements of the military-possibly the elite presidential guard" shot down the plane, although another report blames the RPF, which "denied responsibility." "Military elements" are also identified as killing the opposition Hutu Prime Minister and "the killing of several other Rwandan cabinet officials including the senior ranking Tutsi." At this point, "the fighting appears to be limited to the capital". Explaining the violence, the analysis concludes "Ultra conservative Hutus had been opposed to the peace settlement agreed to by the Hutu Rwandan government and the rebel Tutsi Rwandan Patriotic Front (RPF)." U.S. defense attaché Lt. Col. Charles Vuckovic USA was posted to the U.S. Embassy in Cameroon, but he also had responsibility for Rwanda-thousands of miles across the African continent. Coincidentally, Vuckovic had arrived in Rwanda on April 5th. Given his background, his reporting proved useful to Washington policymakers and his presence contributed to the evacuation of American citizens. This heavily censored appraisal from later in the afternoon of April 7th conveys information from Lt. Col. Vuckovic that Rwandan Army Headquarters "reports that the Presidential Guard is "out of control" on the streets of Kigali while all other military units remain in their barracks". Lt. Col. Vuckovic saw "no effort by other military units to stop the presidential guard". His report, while again identifying the Presidential Guard as key perpetrators of the violence, otherwise suggests control, organization and discipline among the regular army. President Clinton's statement expresses his shock at the deaths of Rwandan President Juvenal Habyarimana and Burundian President Cyprien Ntaryamira. He "strongly condemn(s)" the murders of Rwandan officials, including Prime Minister Agathe Uwilingiyimana, by "elements of the Rwandan security forces", and calls on "all parties to cease any such actions immediately." Colin Keating, New Zealand's Ambassador to the United Nations, sat as President of the UN Security Council during April 1994. Keating's statement reports the deaths of the presidents, "the deaths of Government leaders, many civilians and at least ten Belgian peacekeepers", and strongly condemns these horrific attacks and their perpetrators." Specifically identifying the parties involved, the President's statement urges "the Rwandese security forces and military and paramilitary units to put an end to these attacks and to cooperate fully with UNAMIR", the UN mission in Rwanda. During his term, Keating pressed hard for a UN response on Rwanda, arguing early to increase the strength of UNAMIR (Note 4) and urging a Security Council declaration of "genocide". His efforts were in vain; the Council's permanent members-the United States, Britain, France, Russia and China-succeeded in suppressing any Security Council initiatives. At 1 PM on April 7th, Secretary of State Warren Christopher established a "24-hour working group" as "the center of all Department activity" concerning "the situation in Kigali and Bujumbura." The task force concluded its work April 15, following the evacuation of American citizens and the closure of the U.S. Embassy. Notably, at this early stage, the State Department apparently perceived the crisis as confined to the capitals of both countries. Christopher appointed Deputy Assistant Secretary Bushnell as head of the task force. Bushnell would go on to play a major role in the U.S. response to the genocide; after the working group concluded, she headed an inter-agency task force designated with monitoring the crisis and developing and implementing the U.S. response. This summary for top State Department officials reports that "Rwandan troops had kidnapped and killed" Belgian troops serving in the UN mission, as well as the murders of Rwandan government ministers. It also reports "the army high command" assertion that "a missile fired by Hutu hardliners in the presidential guard (PG) downed the aircraft" carrying the presidents of Rwanda and Burundi. State Department analysts conclude "The PG hardliners were operationally in a position to take action"; although evidence is lacking because "the PG has sealed off the site", it is notable that "no one in the Rwandan high command is blaming the Rwandan Patriotic Front (RPF) for shooting down the plane." CIA analysts report to top U.S. officials that "Hutu security elements from the Presidential Guard, gendarmerie, and military yesterday killed several government officials-including the Prime Minister"; "killed numerous Tutsi civilians in Kigali"; and "killed two Belgian civilians and 10 of the 450 Belgian UN troops". Their report adds "what remains of Rwanda's civilian leadership and moderate senior military officers appear unable to restore order", suggesting the hardliners have killed or put-down opposition and are pre-dominant. This memo informs Secretary of Defense William Perry and Deputy Secretary of Defense John Deutch of talks between the rebel RPF and Rwandan government under the auspices of UN Force Commander Dallaire. Pentagon officials see "a glimmer of hope that this crisis is waning." Pentagon officials describe the Presidential Guard as "Hutu-extremists who probably shot down the President's plane". With regard to the U.S. response to the crisis, Pentagon officials inform Perry and Deutch that that the State Department and National Security Council have not sought Pentagon input for their response to a Belgian request for airlift-the first evidence of policy disagreement and bureaucratic infighting on Rwanda that would continue throughout the crisis. Finally, the officials report that "the French, Belgians, and the UN are all discussing evacuation of citizens/PKO forces" and that U.S. military planners are "meeting with Belgian and French military". Within 10 days, almost all Western officials and Western citizens will have left Rwanda to its fate. Under the power-sharing Arusha Accords, the rebel Rwandan Patriotic Front had stationed a battalion within Kigali, although all other RPF forces remained north of a demilitarized zone (DMZ) in northern Rwanda or at camps in Uganda. In addition to killing prominent Hutu and Tutsi civilians, Rwandan military forces attacked this RPF battalion. On April 8th, RPF forces launched across the DMZ "because the ceasefire had been violated, its Kigali contingent had been attacked, the Rwandan army is killing officials and Tutsis, and the UN is unable to control the situation" as RPF leader Paul Kagame told a U.S. defense attaché. The resumption of the civil war had important consequences: for the RPF, it was necessary to rescue both their comrades in Kigali and to rescue Tutsi civilians; for the Rwandan military, it served to solidify ranks which were divided over the military's involvement in killing civilians and taking power; for the interim Rwandan government, it would provide an excuse for prosecuting a war against the RPF and any civilians it considered "accomplices" of the RPF, including Tutsi women and children, and it directly threatened the government's existence; and for outside observers, including the U.S., UN, and others inexperienced with Rwanda's history, it confused the killing of civilians with fighting between regular forces and discouraged outside intervention, particularly in the wake of the U.S. and UN experience in Mogadishu. By the close of April 8th, the situation was bad and getting worse in Rwanda, Western nations wanted out, and they acted decisively. This Rwanda task force situation report notes "the Belgian government has decided to evacuate its citizens", but is still "willing to keep their UNAMIR troops in Rwanda after the planned evacuation", while "the French have agreed to take control of the airport". This report also describes White House involvement in the crisis, recording "NSC has given approval to State and DoD to plan for a joint U.S.-Belgium-France operation to evacuate our respective nationals." It also reports that the Belgian Prime Minister and the UN Secretary General want to "strengthen" UNAMIR at least with "equipment and/or firepower" if not "with more troops". Instead, a week after the UN force finished assisting the evacuations by Western nations, the UN Security Council voted to gut the force and leave Rwanda to its fate. 1. Lieutenant General Romeo Dallaire with Major Brent Beardsley, Shake Hands with the Devil: The Failure of Humanity in Rwanda (Toronto: Random House Canada, 2003), p. 232. 3. Jeffrey T. Richelson, The U.S. Intelligence Community, 4th ed., (Boulder: Westview Press, 1999), p. 317. The NID has been succeeded by the Senior Executive Intelligence Brief.